Over 800 modern or ancient games, from every continent, invite you on a journey through a ludic universe and to live emotionally charged moments. Board games, agility games, supersized games…. With all our games you will be spoiled for choice. For all room rental, access to the games is included. The outdoor space for oversized games. Finding a game that suits you? Nothing is easier! Our animateurs, game specialists and savvy players, are by your side in the game rooms. These attentive guides welcome you all through the afternoon and the evening. Party or rapidity games, they will know how to advise you depending on your temperament and desired emotions. Therefore, thanks to them, you don’t waste time decrypting the rules. You go straight to the essential! 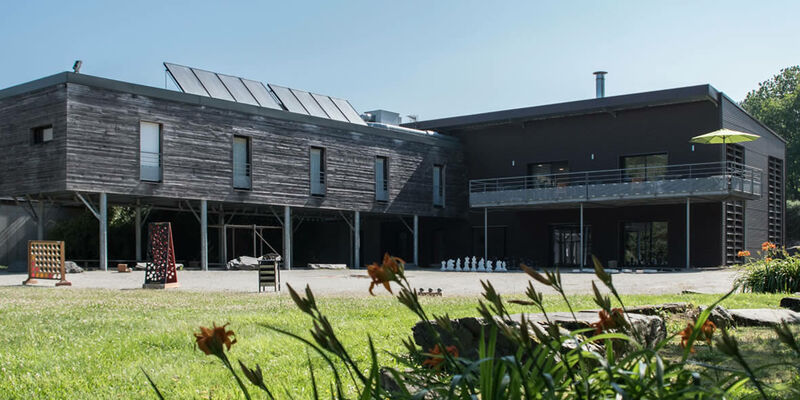 At the Auberge des VoyaJoueurs, no matter the type of player, there is something for everyone, with a large variety of games, from board and agility games to supersized games…. Impossible to be bored! Three game areas are at your disposal. As soon as you arrive, the board game room welcomes you. 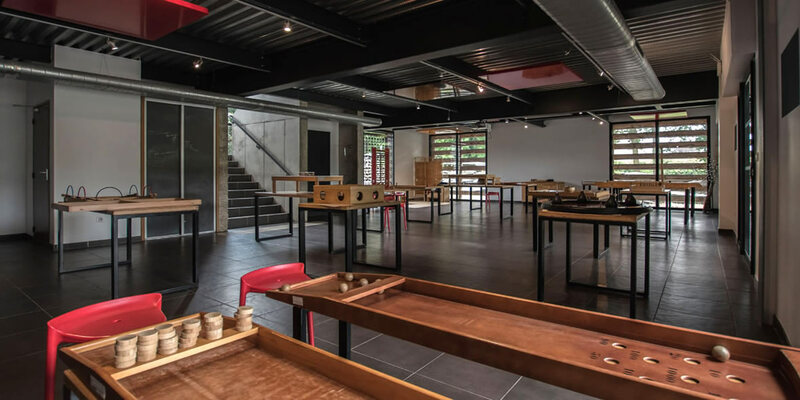 At the garden level, come learn to play the many forms of billiards (Dutch, Nicolas, Japanese, Indian billiards), and games of agility, precision, speed, cunning and intelligence. 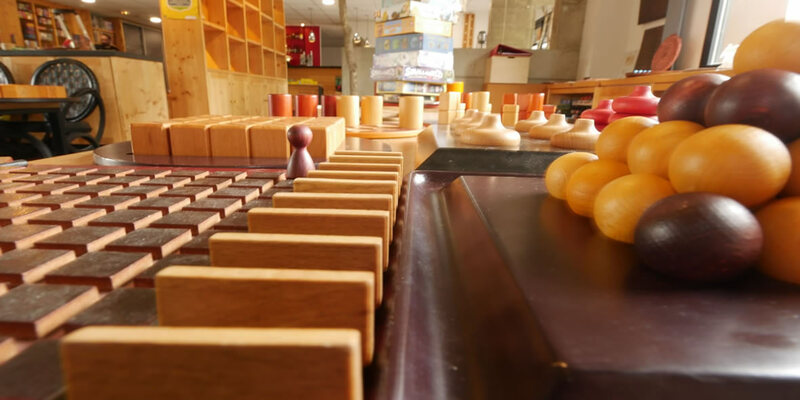 On your own, or in a group, it is not only children who like wooden games! And what if you pushed the door to the garden to access the outdoor game area, many supersized games are waiting for you: giant four by four, stilts, chess, black mountain, giant pick up sticks, skittles, and many others. Little or big sweet tooth, between two games, stock up on energy with our snacks. Our large choice is written on our daily board. You have made your choice? Have a look at the bar menu to choose your favorite drink. There you have it! In summer, our large terrace open onto the games park invites you to toast when it’s aperitif time. 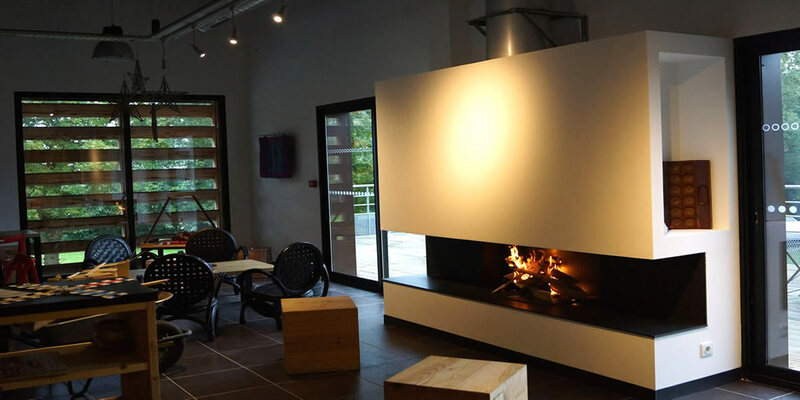 Whereas in the winter, warm yourselves with a delicious hot chocolate by the fire. If you are coming as a group, a personalized animation package if accessible on reservation. You could start a tournament, go on a ludic trip across the continents, complete a riddle walk on the Monteneuf heaths… You choose the theme of the game and a dedicated animator will take care of everything! Playing gives you an appetite! That’s why, with a reservation, we can offer you ludic menus and buffets that combine access to the games and a meal. We are supplied mainly by local producers to offer you a service that is both ludic and gastronomical! Do not hesitate to contact us for the organisation of your parties, birthday snacks and various events. In the winter, warm yourselves with a delicious hot chocolate by the fire.